The Meros High Speed Digital Microscope features high magnification optics and a zoom lens to ensure that millimetre to micrometre scale features can be visualised clearly, with the added benefit of an extra-long working distance. Coupled with a high speed USB 3.0 camera, this allows clear imaging of moving particles or cells, enabling quantitative analysis of droplet size at low flow rates – typically below 1 kHz – and qualitative evaluation at production speeds of 2-15 kHz or higher, depending on droplet size. 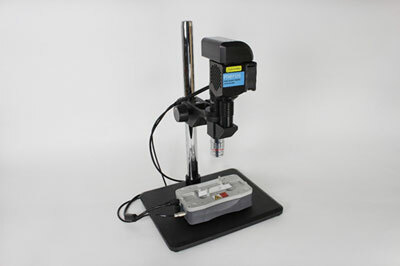 The microscope’s easy-to-use stage is designed to securely hold a wide range of Dolomite Bio and third-party microfluidic devices, including chips, connectors and the µEncapsulator 1 module. An integrated LED coaxial lighting system offers exceptional brightness with very low exposure times, with an optional reversible mirror and diffusor, allowing production of publication-quality images. Illumination from above also leaves the underside of the microfluidic device free for temperature regulation systems, such as the Meros TCU-100 temperature controller. To simplify operation, the entire system is controlled by Dolomite Bio’s intuitive Flow Control Centre software, allowing straightforward live imaging, adjustment and image capture.